​The Conti Group was ranked again as a Top Contractor, Top Hazardous Waste Contractor and Top Contractor Working Abroad from Engineering News-Record Magazine (ENR) for 2016 earnings in the Architecture, Engineering and Construction (AEC) industries. 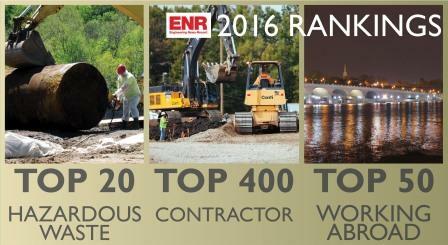 Each year, ENR publishes the Top 400 Contractors List, which ranks participating contractors across the United States by their revenue earnings from the previous year, and highlights industry leaders in individual market segments. Continuing its upward trend in revenue, Conti moved 19 places closer to the top of the Top 400 list this year. The company also ranked among the Top 50 Contractors Working Abroad list, due to its sustained project successes overseas, moving up seven places from its position in 2015. Lastly, Conti again appeared on the Top 20 Hazardous Waste Contractors list, an industry in which the company has been rooted for over 35 years. “The team is proud of this accomplishment and Conti’s recognition as a leader in our markets within the AEC industry. ENR’s market analysis supports our internal strategies for how we are companies are doing and how our markets are evolving,” stated Kurt Conti, Chief Executive Officer of the company.